This week was a 5-run week. After last week's adventures, I was tired and sore! I wasn't sure how I'd be able to handle running 5 days in a row and my longest week, mileage-wise, of my training cycle so far. I'll only have one other week this training cycle that is this many miles. Steady pace day. Boring me, back to River Park! I like to have the comparison week to week right now. It's energizing to see my progress from week to week. Eventually, I'll probably get sick of doing this and want to mix up where I run, but until then, I'm going to keep rocking on. I was sore and tired from the endurance ride, but I decided to try to do the steady pace run. Target pace 12:36/mile. It was warm with 88° and 64% humidity. I managed to run the entire thing. I ate a single Gu gel at mile one. When I stopped running my left hip and outer thigh hurt for a minute or two, but I walked it out and then stretched it really well. I took a really hot bath when I got home. Heat seems to be an important element of my recovery process. Back to the treadmill for 5 easy miles. 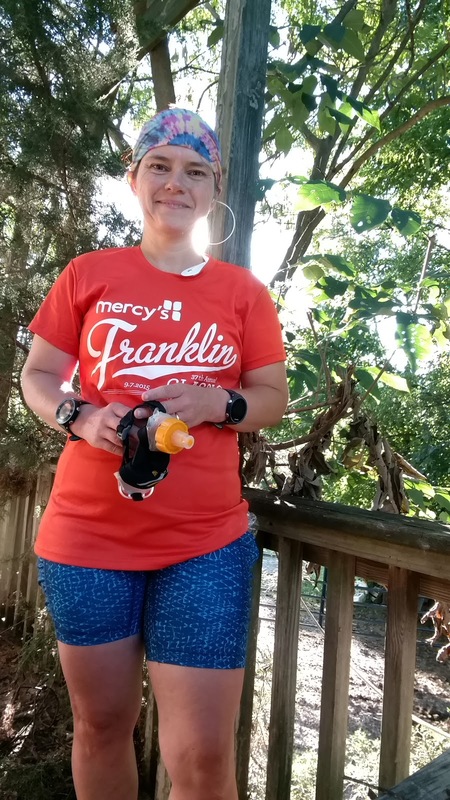 My left hip gave me a little pain for the first mile, but worked out of it. This was on a 0.5% incline. 4.5 minutes at a 13:03/mi jog and 1 minute walking. 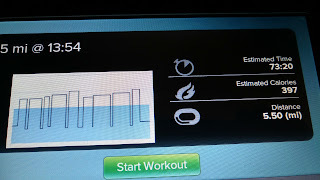 My heart rate maxed at 143, but most of the time well under. A very easy run. Time to bump the incline on these. 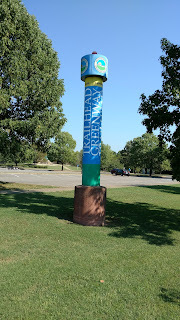 Pillar announcing the greenway trailhead. 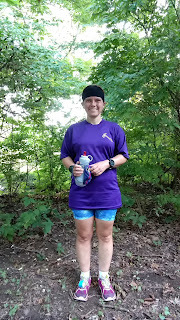 I drove out to Stones River Greenway in Murfreesboro for my long run. Average target pace 13:29/mile. Overall, I felt this was a hard run for me. I did run/walk intervals of 4 minutes 15 seconds at a 12:30/mi pace and walk for 1 minute. Over the course of my run, the temp climbed from 72° with 94% humidity to 85° and 73% humidity. Overall, I did a good job of hitting my splits within about 10 seconds of goal pace. My heart rate was getting pretty high on the last couple of miles, though. 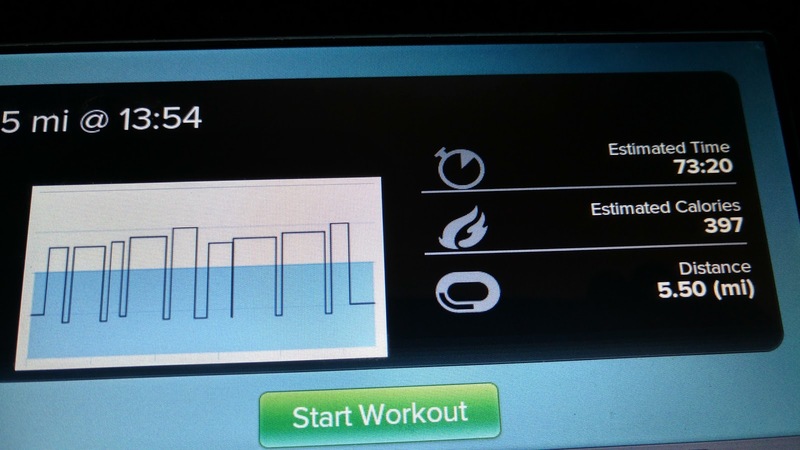 I did ok on my heart rate for the first 5 miles, then had a 10 bpm jump and then didn't recover from that. I got pretty distracted and my split for mile 6 was 13:06 because I wasn't controlling my pace very well. Apparently, I never really recovered. I'm going to hang out at the 10 mile mark for my long runs for the next couple of weeks. Back to the treadmill. 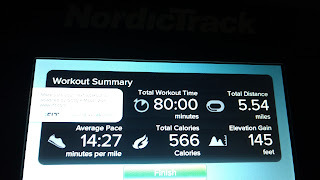 I got bored on Tuesday, so I changed up my run by bumping the incline to 1% and changing up my run/walk intervals so I was running up to 5 mph for some of the intervals and never really knew when I was going to walk or jog. 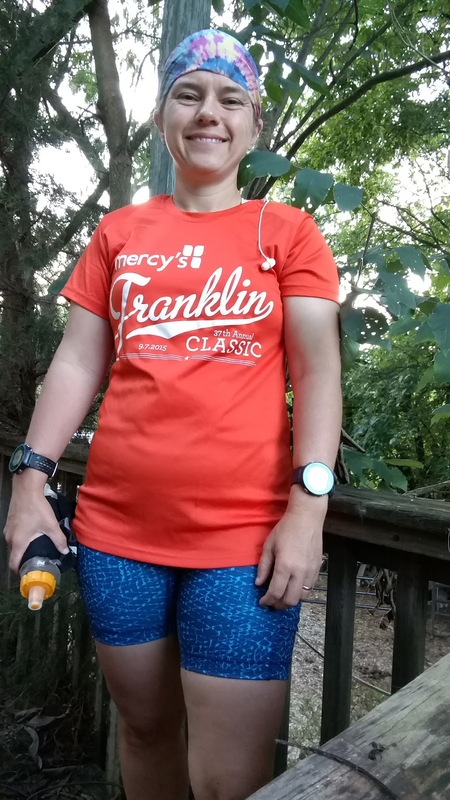 Not knowing exactly when I would walk or jog was interesting, but I think I defeated the purpose of the easy run by running faster than my prescribed 13:03/mi pace for some of the intervals. Sleepy, but ready to run. Best Hill Friday so far. My uphills were about the same speed as when I ran this hill 2 weeks ago. I still did the 30 minute jog; 90 second walk uphill. But I really paid attention on the downhills and ran to keep my HR 145-155 even on the downhills. This bumped my overall average pace. I really didn't want to do this run when I started, but I'm glad I did. Overall, I'm happy I'm doing specific hill training this cycle. I think it's making me a stronger runner. Next time I run this hill, I'm going to alter my uphill intervals. 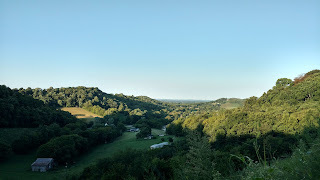 I still feel challenged by the 30 second jog, especially on the steeper parts of the hill, but I'm more than recovered by 90 seconds, so I'm going to drop the walking interval to 75 seconds and see how that goes. Happy to be done with another week and proud of my Friday Hill Run! I'm really pleased with how my runs went this week. Almost 30 training miles, my longest week, coming off an endurance ride and a lot of running to boot and still hitting my paces. Pretty happy with how this training cycle is going. Due to more vacation time in September, I'm going to break from my 3-run, 4-run, 5-run pattern. So this week, I'll run 4 times instead of 3 and the following week 5 times. I feel confident that I have a good base to skip the 3-run week this time. We'll see how that goes! First up is the Labor Day Franklin Classic. This is the 3rd or 4th time I've run this event. They have a cool deal where you can run the 10k and the 5k for only $5 more than running the 10k. So I like to do both. Too bad I only get one shirt! Completely looking forward to this run!